Awesome in Quest Priest. 3 mana for a 4/4. Opponent draws one card. That's okey in my book. Best card art in the game. 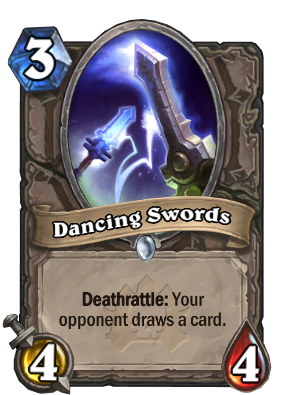 Even in a Mill deck i could see this card being hard to use seeing as how it's a Deathrattle ability. If he dies offensively then he might be useful for Milling your opponent but he could be played around on your opponents turn.....or at least that's what I see. I guess he's pretty good on turn 3, or two if on the coin. His drawback is pretty significant, especially when you compare this guy to the rogue's ambusher. All in all this is still a playable card and it fits only in the most aggressive decks out there, where you don't expect the one extra draw to come into effect. I think having a 4/4 body for 3, even with the deathrattle, is worth it if all your trying to do is kill your opponent. Compare to Harvest Golem who has the same stats, but split over two bodies and is much better if you're trading/trying to stall the game as long as possible. Combo with Good Guy Rivendare to gift your opponent 2 cards. Combo Deathlord with Good Guy Rivendare to gift your opponent 2 minions on the field. Going off River Crocolisk/Chillwind Yeti/Boulderfist Ogre logic, the proper size for a 3 mana minion without abilities should be 3/4 or 4/3. This is a 4/4 with a detrimental ability... seems pretty weak to me. Sure, it dodges Shadow Word: Pain/Shadow Word: Death and wins combat against almost any other 3-drop, but keep in mind that it only trades with Harvest Golem instead of outright beating it. I think the Golem is the better deathrattle card in this slot, despite the power drop. However, I can see this in mill decks as an efficient beater with a drawback that actually works for the player. All in all, it's a mostly below-average card with one above-average application, and maybe that's enough to consider it decent. We'll just have to wait and see. Another thing to consider is Undertaker, people testing Undertaker on sims have been running this card just to buff it. If we get a better 3 drop with Deathrattle, other than Harvest Golem of course, this card will really decline in value. With Baron, though, this card has massive potential in a specialized Mill deck, especially if more mill cards are released.